We present to you a brand new set of catalogues of our products for the year 2019. 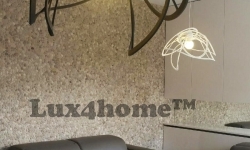 • Stone sinks collection by Lux4home™ 2019. Contains pure novelties introduced only recently to our offer. The innovative design of the marble sinks is based on current bathroom trends that could be observed in the most exclusive interior design shows all over the world. The shapes of the washbasins are modern and minimalistic, adjusted perfectly to the stone qualities and structure. Find the catalogues under this link. Includes the top favourite bathtubs among our global customers. Inside, you can find some ideas and pictures on how to install a pebble bathtub basing on our clients’ ideas from last year. 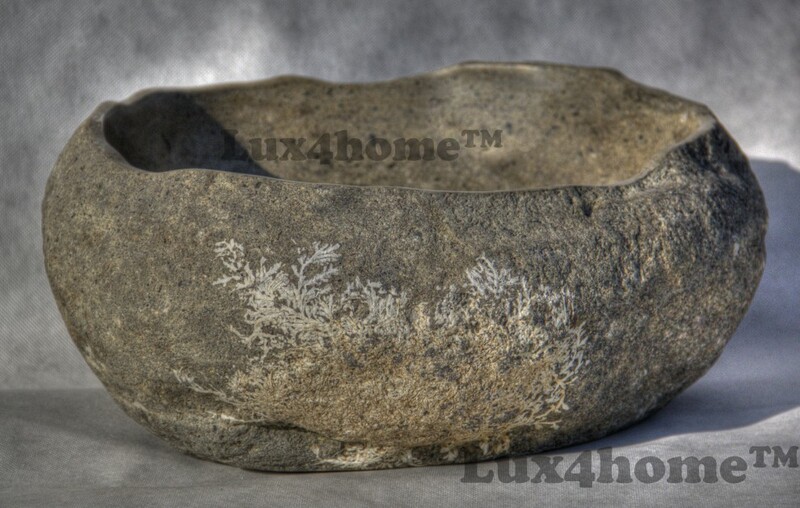 Natural stone tubs are reminding us year by year that the beauty of pristine Indonesian stone has no competition. Those who were lucky to take a bath inside a beautiful stone tub know that the comfort and sensations are simply uncomparable to any other bathtub. Download the full catalogue here. As the very first ones, we prepared a lifestyle catalogue with bathroom ideas and inspirations of interiors equipped with natural pebble stone sink. River stone collection has been growing more and more popular in designers’ minds, that is why this catalogue is a hat full of bathroom ideas and a perfect representation of how natural stone sinks look in context of different interiors. See the full catalogue. • Pebble Tiles & Pebble Mosaics Catalogue. 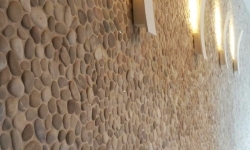 Discover the possibilities in applying the natural Stone Pebble Tiles on mesh. We proudly present the opportunities that you can create for your clients thanks to our diverse and colourful Pebble catalogue. Many importers specialize solely in distributing these mosaics thanks to their versatility and growing popularity. 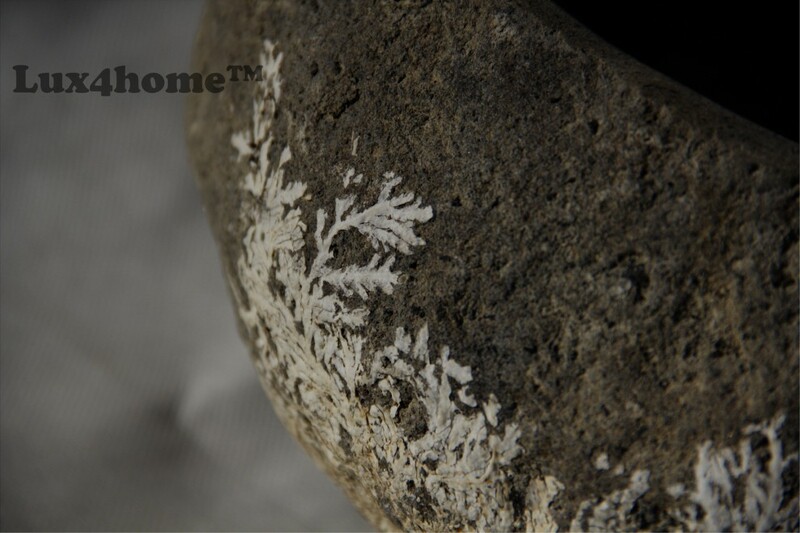 See the catalogue here and bring Indonesian shore to any place in the world! • Tiles fit perfectly to each other. The interlocking pattern makes the connections between tiles seamless. • Pebbles are consistent in size. This allows to easily install any bathtub, mirror or a cabinet. • Very small spaces between the pebbles makes the grout imperceptible. • The netting and the glue are highly resistant to moisture, temperature changes and are environmentally safe. • Mesh does not putrefy. • Pebbles are consistent in terms of colour and shape. 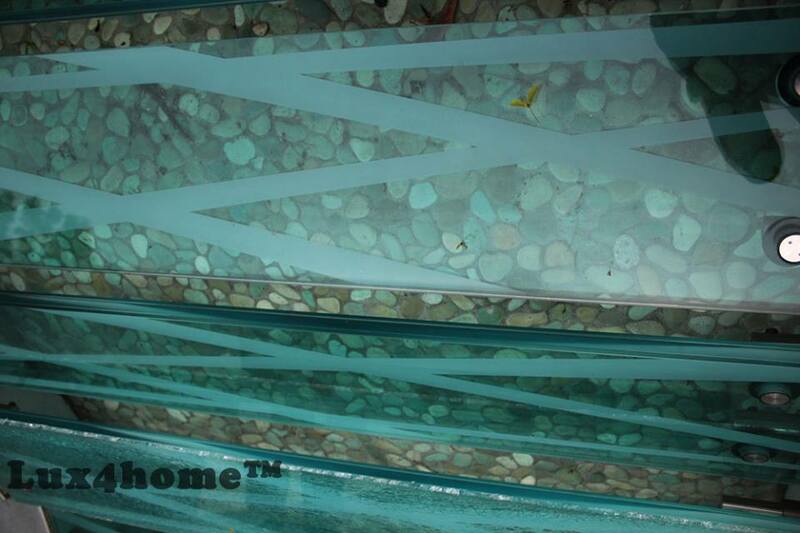 Pebble tiles on netting White Timor (the name comes from the island) are produced in Indonesia. Every single pebble is carefully selected considering its colour, size and shape to ensure the highest quality of the final mosaic. 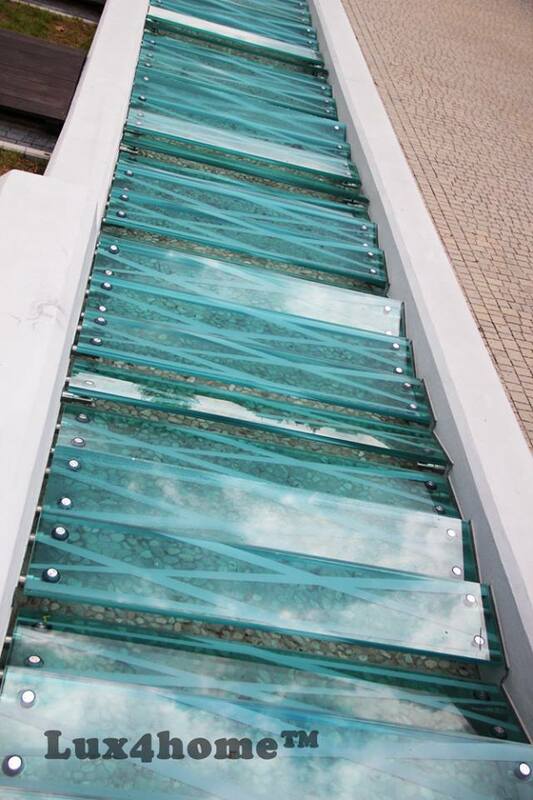 The pebbles are then fixed into vinyl mesh that does not absorb moisture and is highly resistant to any atmospheric conditions. The use of non-toxic, environmentally safe glue results in a solid and everlasting tiles. Moreover, the uniqueness of the interlocking pattern in which the tile is created contributes to the formation of one consistent mosaic decoration. It is virtually impossible to tell where one tile ends and the next begins! 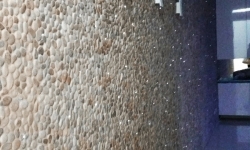 Besides the bathrooms, the pebble mosaic may be installed in a variety of places. 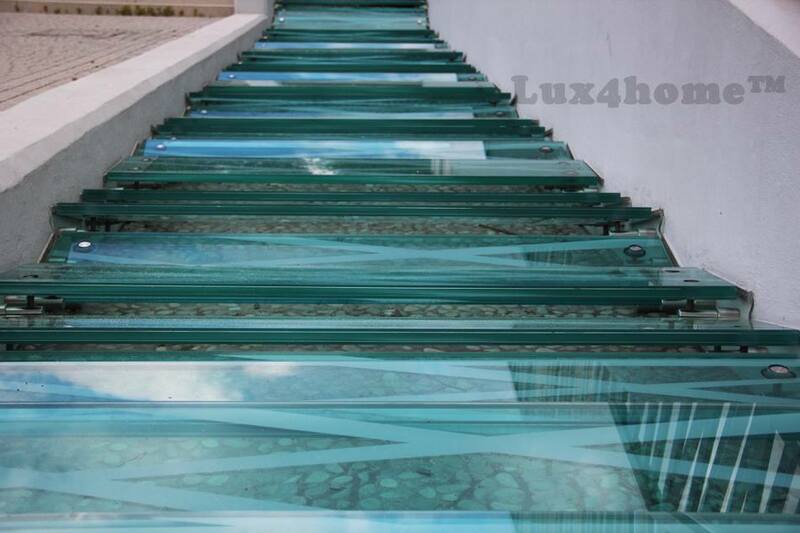 It can be applied to different pebble floors, backsplashes, saunas, swimming pools, patios, fireplaces, living rooms, pebble walls for TV and many more. Indoors and outdoors. Commercial or private property. Can you imagine placing each pebble individually? Don’t worry! 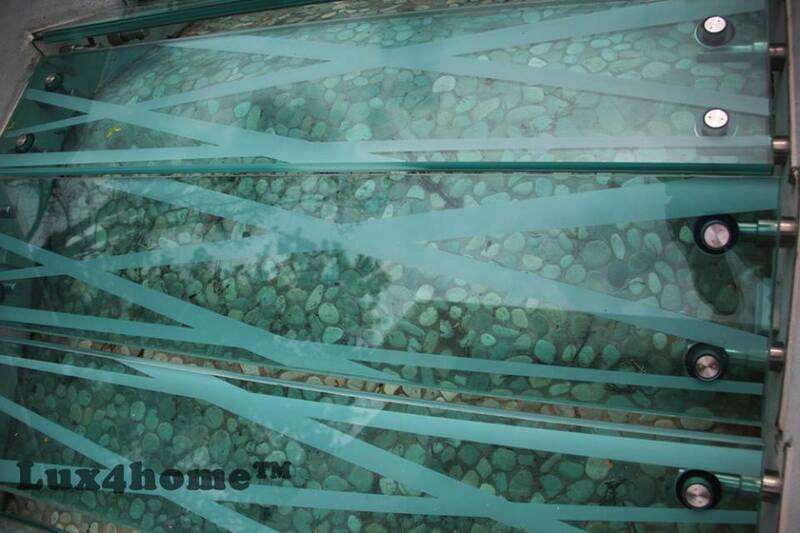 These pebbles are put on vinyl mesh! That way covering entire wall takes minutes. It is as easy, as placing traditional tiles. However, the finall effect is way more spectacular! Don’t you think? 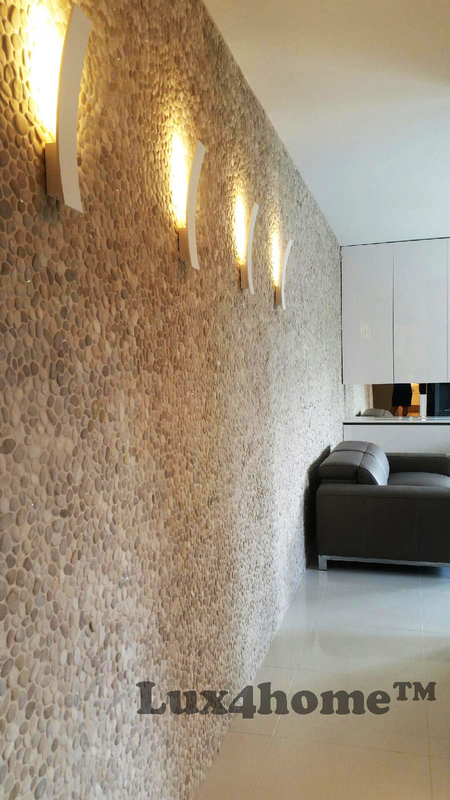 Please have a look at this Maluku Tan Pebble Tiles produced by Lux4home™ in Indonesia. Each single tile consists of number of similar pebble stones. Similar shade, colour and size make entire tile look ellegant, and still natural. 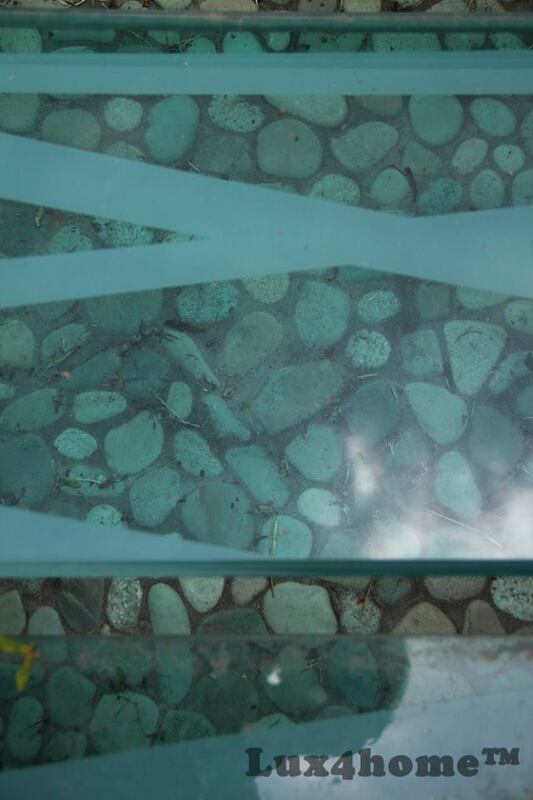 Maluku Tan is one of the most popular color of natural pebbles. Variety shades of gray, and beige or even sometimes very light brown. These natural coloures make any interior look cozy and warm. It really does not matter if you place them on floor or on a wall or if on a bathroom, hall or livingroom. Either way they always fit and look great. You may wonder how it is possible that there are no visible joints between tiles. It is tricky! EasyFit Interlocking System makes each single tile perfectly fit another – just like puzzles. 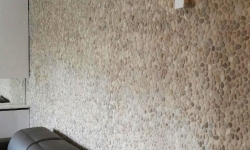 That is why, entire wall looks like it was covered with pebble loose. 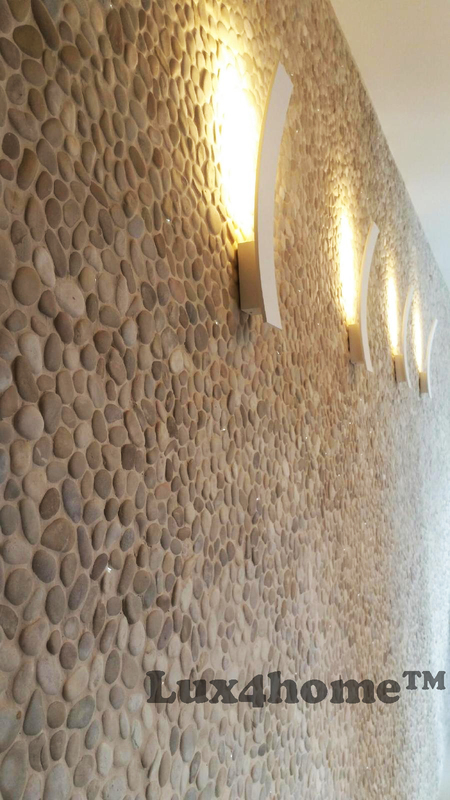 Natural pebble mosaics on mesh are often used not only in luxury bathrooms, but also in gardens, SPA centres and luxury restaurants. They fit perfectly any design you can think of. Wherever placed, they always change one interior into the one full of charm and unique. 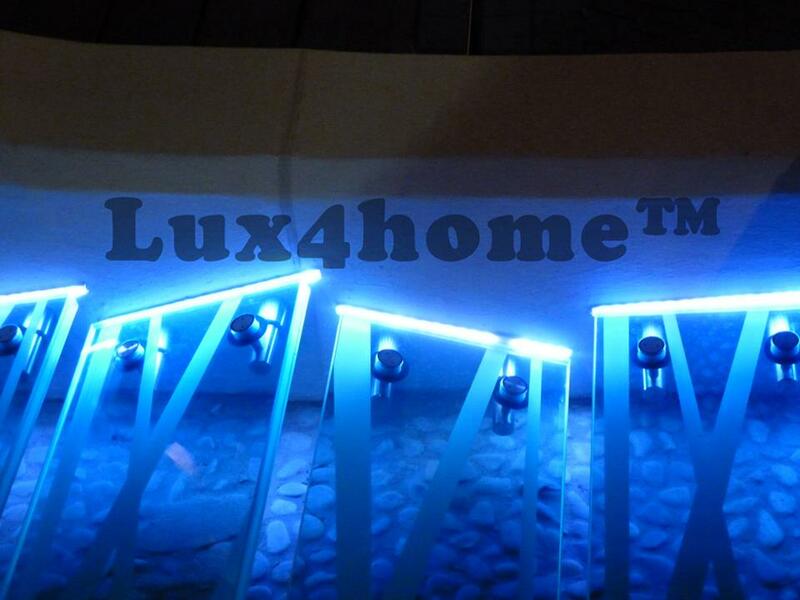 Please notice that all pebble tiles, and marble mosaics produced by Lux4home™ in Indonesia are CE tested. They are allowed to be sold over the globe. 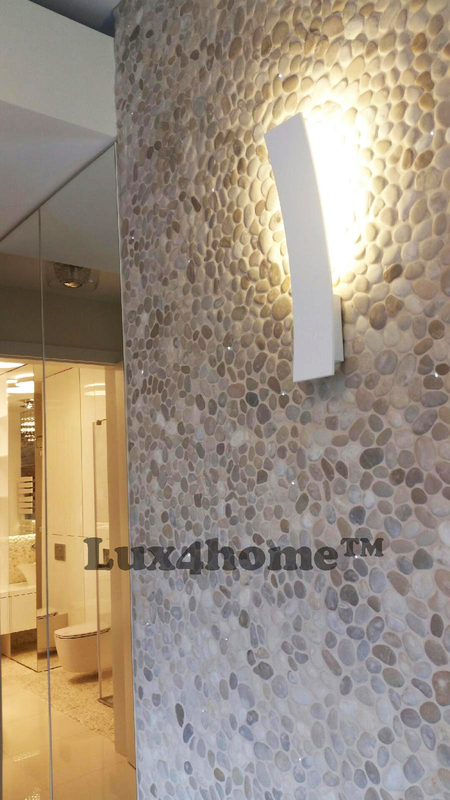 Pebble Tiles Collection of Lux4home, that consist of variety of mosaics, borders or even standing stones got many awards mostly in Europe. However thanks to their natural beauty and uniqueness they are appreciated also in America and Australia. All our products are famous of using only natural techniques of production. You will find no paint, no nor putty in any mosaic we manufacture. It is all handmade always! Highest quality is guaranteed always! 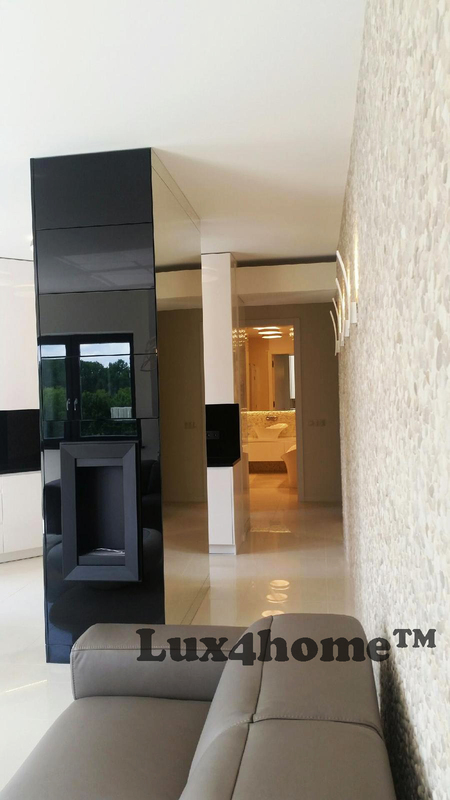 Interior designers, stone mosaic distributors, importers of natural stone products or bathroom fittings, you are all welcome to cooperate with us. 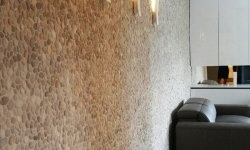 It is most common for the interior designs, such as living rooms, that wall covered with stone slate look so that individual elements of the slate overlap. however the whole slices do not! It neither looks good nor prestige, nor even spectacular. And after installation it has nothing to do with beauty of natural stone. 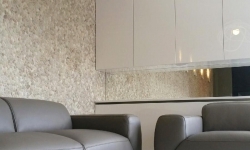 Decorative wall in the living room or hallway should be refined. 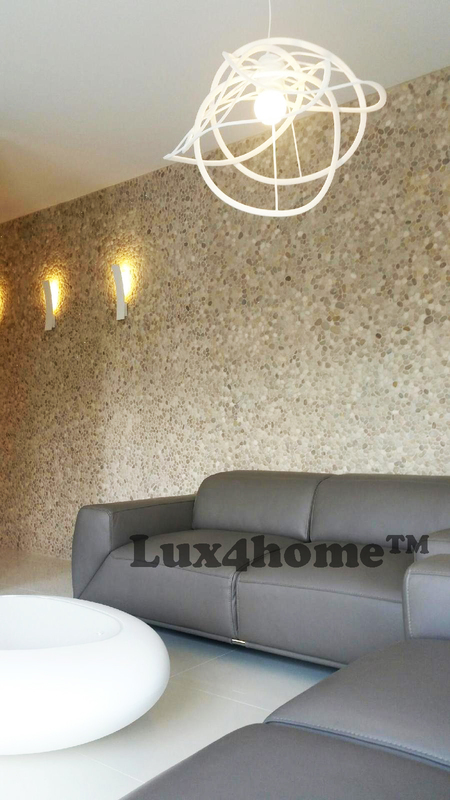 Therefore collection of stone wall claddings designed by Lux4home™ is made that way, that when combining 2, 3, 4 or even 100 slices, whole surrface always looks as it was was arranged with individual components of stone. 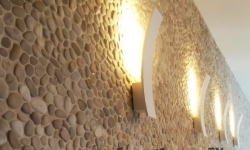 As a result, decorative stone walls in the living room look like on the pictures below …. 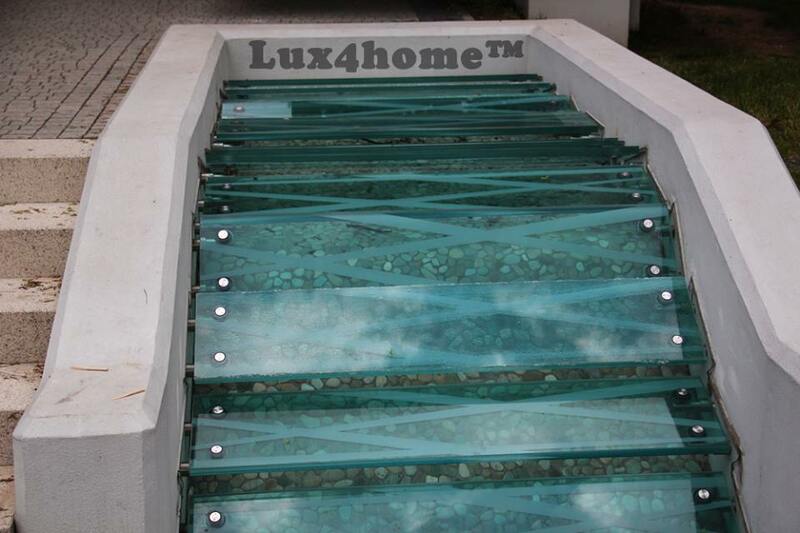 Wall claddings of Lux4home are made of marbles, onyx, sand stones, or even volcano stones. Cream marble and yellow sand stone are most common. 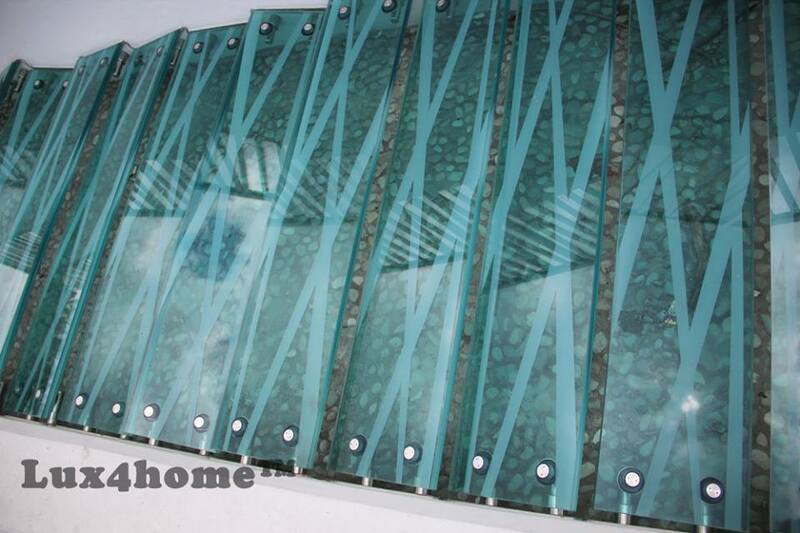 They are used as indoor and outdoor decorative materials. We can supply you with entire collection full of variety of patterns, colors, and stone materials. 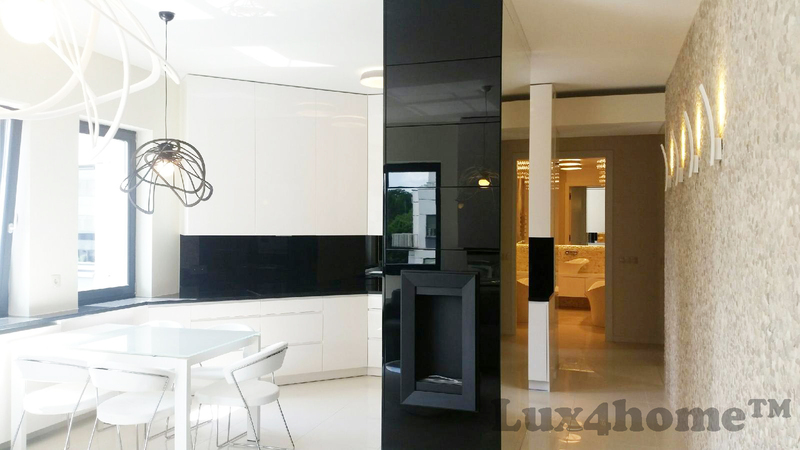 As a distributor or whole sale you have also an opportunity to join these products with stone mosaics, pebble tiles, or even stone sinks and bathtubs, that we produce. That way you are fully covered to fit you clients expectations. Also you may want to create your own collections based on our products! It has never been so easy! 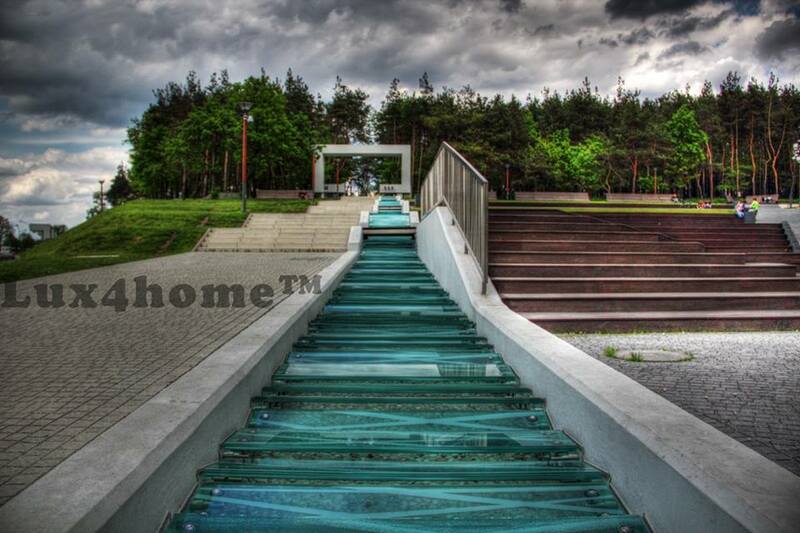 Importing stone products from one supplier gives you never ending possibilities to create your company’s identity. 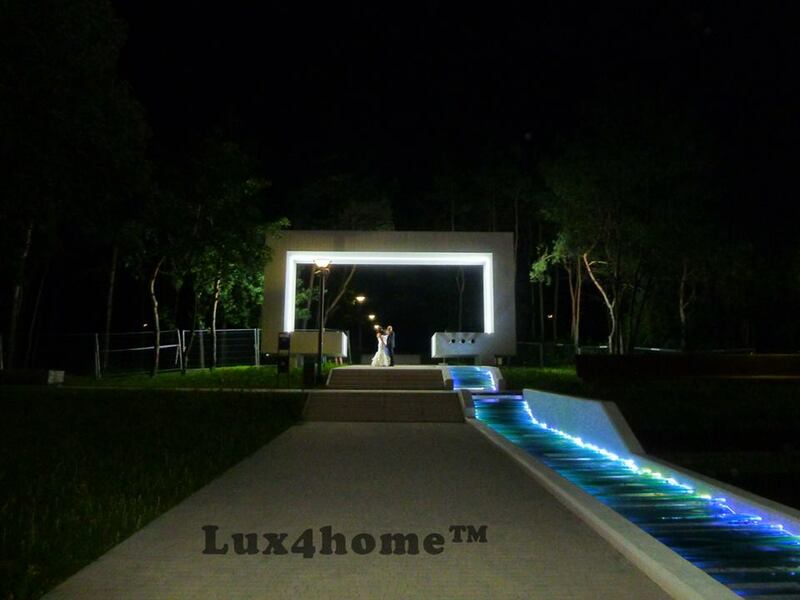 You have recognized by now Lux4home™ as the manufacturer of stone sinks, luxury stone bathtubs, pebble tiles and stone mosaics. 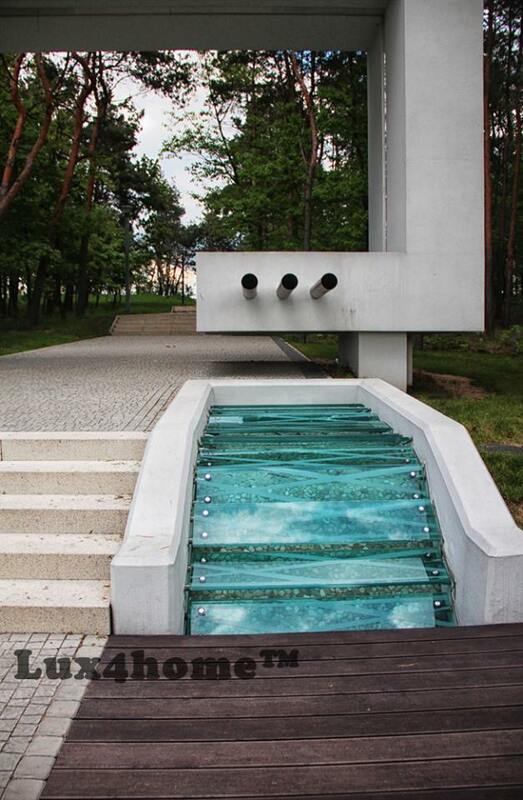 But did you know that we cooperate with number of architects all over the world as well? They are the ones, that make us challenges to improve our products or to spread our offer. 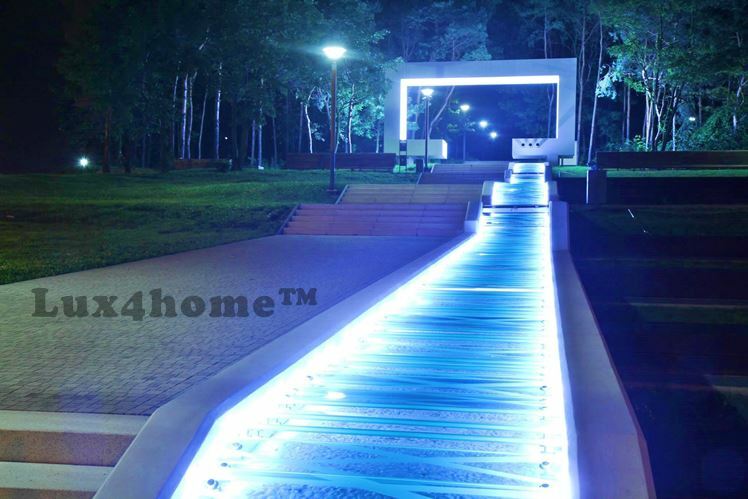 You have already seen some of outstanding interior and landscape designs with our stone and wood products. This is the latest one… Quite minimalistic in its form, but definitely beautiful, and full of charm. 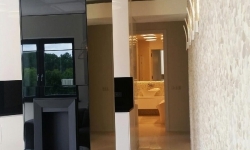 As this bathroom is quite small, two large mirrors were placed on walls. All in all looks luxury and cozy. 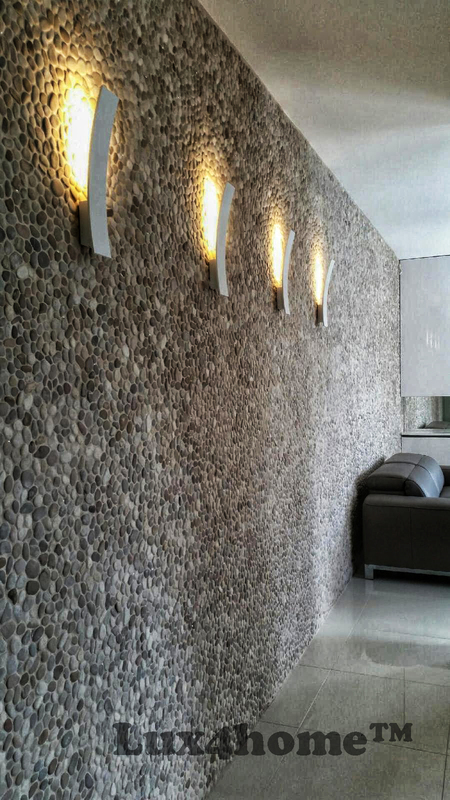 Maluku Tan pebble tiles are made of variety shades of grey boulders glued to a mesh. You may find the brownish ones, the cream ones, or the grey ones. However you should realize that, they were manually sorted regarding: color, and size. Thanks to that, they look very natural, but on the other hand, they make totally flat surface, when placed on wall. Special interlocking system makes it super easy to assemble tiles with no visible joints! As spectacular as easy! Isn’t it? 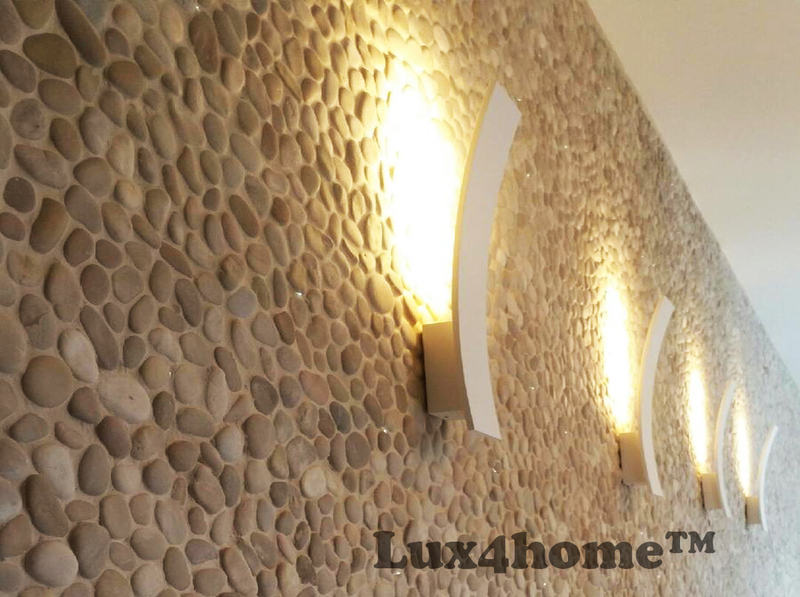 Lux4home™ in a manufacturer / producer & exporter of pebble tiles (like this), standing pebble, pebble mosaics etc. 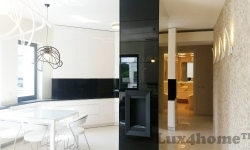 Interior designers, distributors, importers of natural stone or bathroom fittings, you are all welcome to cooperate with us. 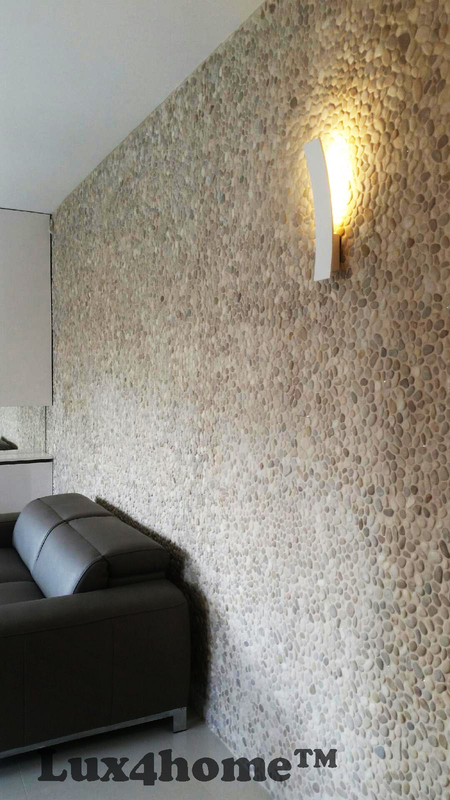 You have already recognized pebble tiles as brilliant idea for covering walls and floors in bathrooms, living rooms, spa centers etc. 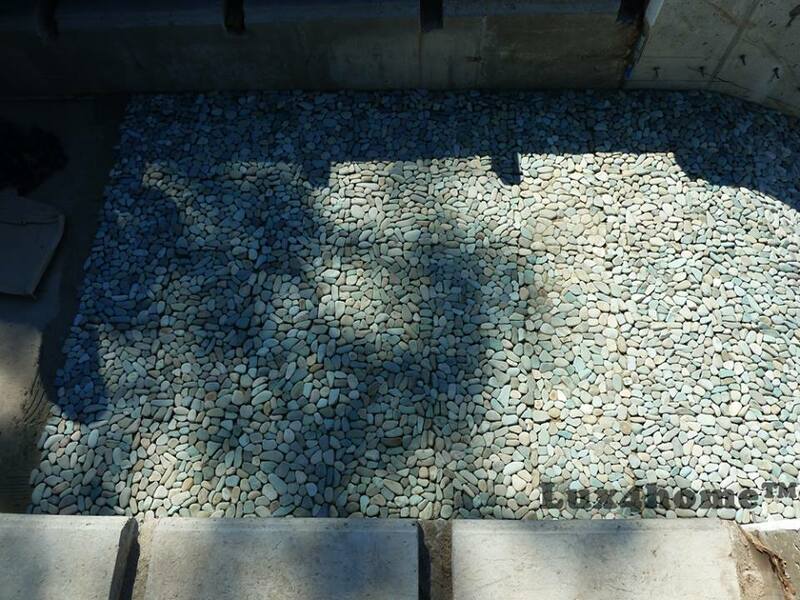 Did you however know that pebble tiles produced by Lux4home™ can be placed outdoors too? 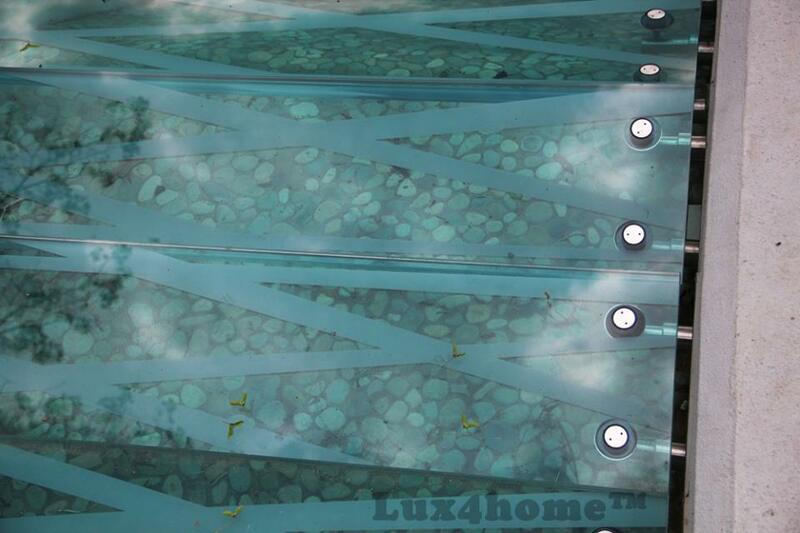 We have shown you by now variety colors of pebbles covering facades, fences, or even swimming pools. But have you seen anything like this? 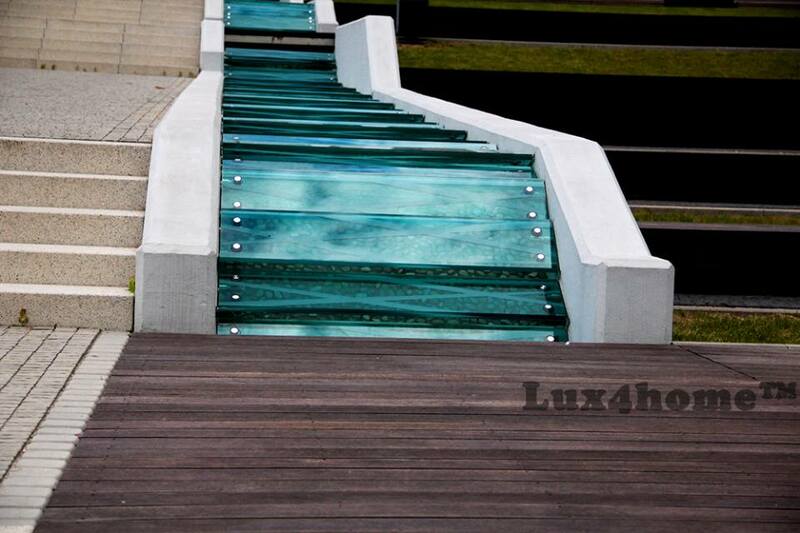 Artificial river in the middle of city square. 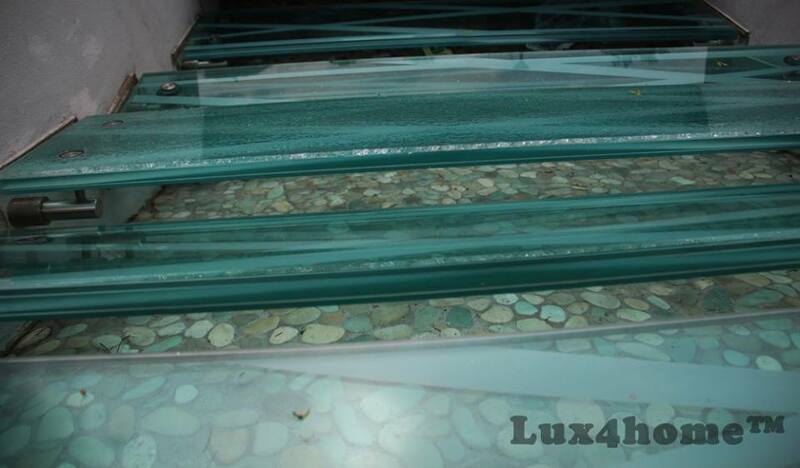 Pebble tiles Taipei Green are a mix of greenish, grey, and brownish pebble stones. They are gatherd from Indonesian rivers. Later on they are being sorted regarding size, shape and colour. Only those, which fit our expectations are used to produce a pebble tile. Stones are glued onto a 30x30cm mesh. Ready made products are packed and distributed all over the world. You may find them on all continents with number of arrangements and projects. Both indoor and outdoor ussage is available. 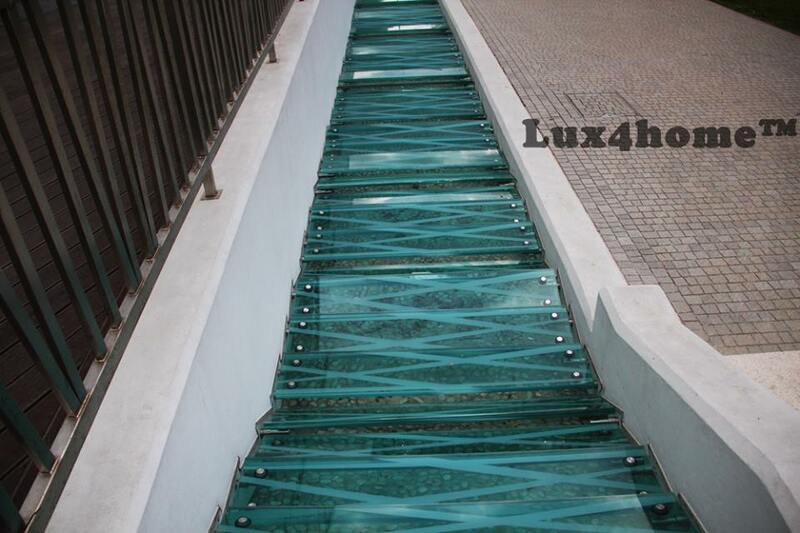 Taipei Green pebble tiles (30×30) cover entire bottom of the river. Plates of blue glass imitate running watter. 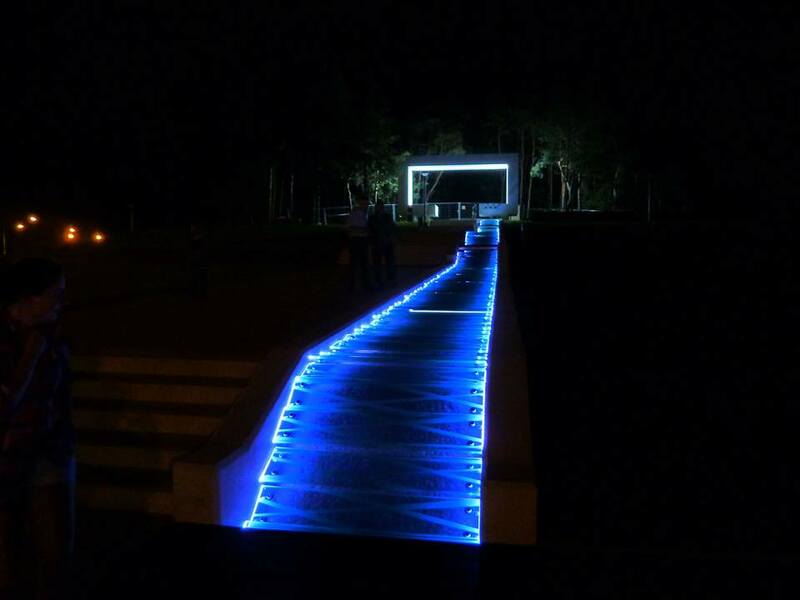 It look even better when illuminated during the night? 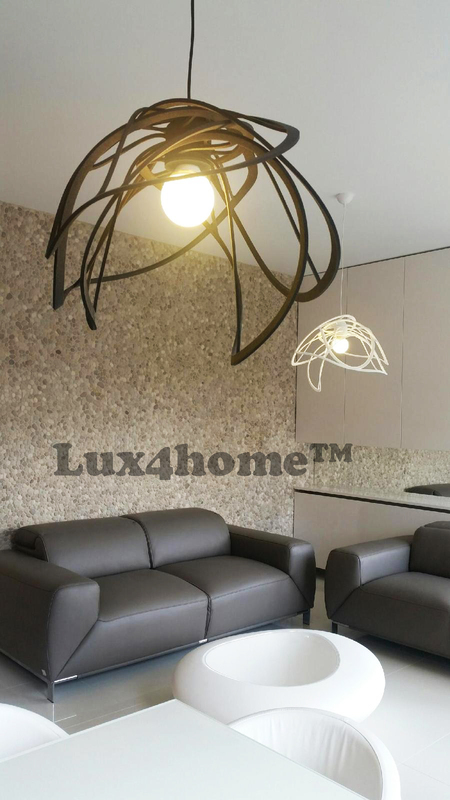 Our clients surprise us more and more with their designs including stone products of Lux4home. Krakow has found out the beauty of natural stone and it’s so much easier to find the interior which can delight you with its charm. One of these places is the hotel which is located on Bracka street, You can find there bathrooms with some products made by Lux4home™. Please look how beautiful it looks. 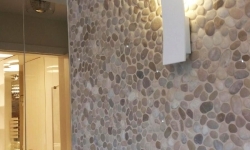 You can easily notice black pebble borders on walls, and beige pebbles on floor. You must admit they look great together with unique sinks and brick wall. 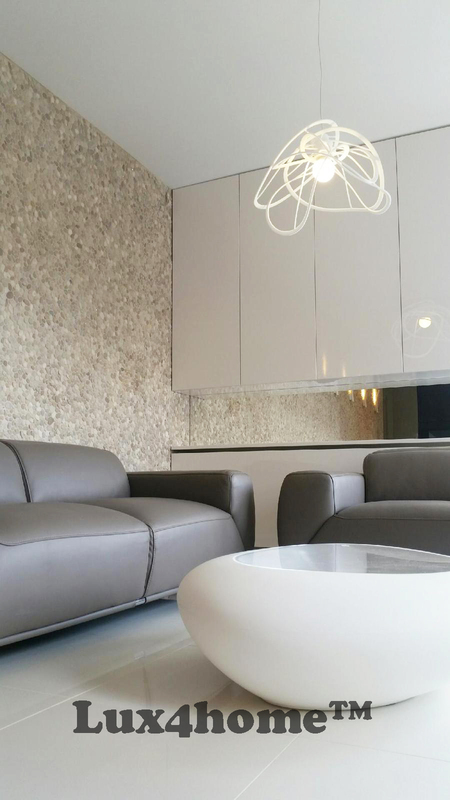 Choosing pebble tiles, you can easily give the room character you want . Natural River Stone sinks are the most extraordinary and unique among all our collection. Each one has different shape, size & shade. Mother Nature made them – we only perfected them with special care and carefulness. Even though we manufacture it in Indonesia all quality standards e.g. CE, are supported. Lavabo Batu Kali is one of the most representative model that we produce for Europe, USA & Canada. It is the highest quality always! 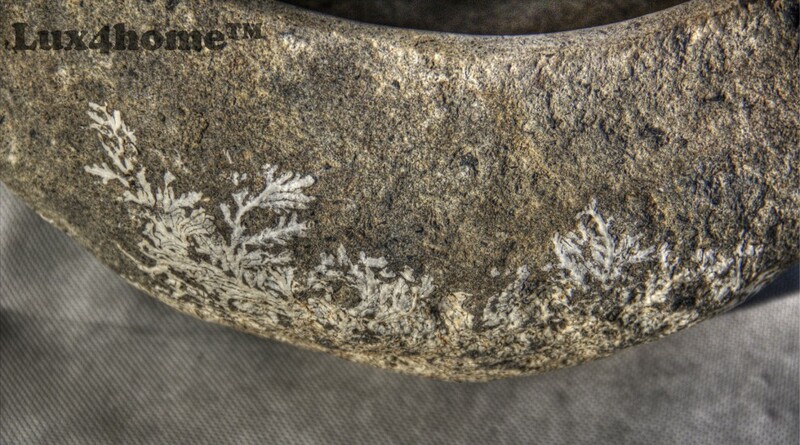 Made of natural river stone is drained and polished. Our very best craftsmen spend long hours to bring then lightest shine of it. We never use any glue or putty. Only natural stone is used. It is also made of one piece of stone always. We never use any glue or putty. It can be produced any size you want. This luxury wash basin has irregular shape and manually polished inside. However the outside remains unchanged just us it was created by nature. Each single sink is unique and differs from others, thanks to structure of stone, mineral incursions and veins. This natural piece of art is often to be seen in high standard hotels, restaurants or even spas. As we produce it for almost all over the world, all required drain hole sizes are available. Also we found it very important to polish drain hole inside as well. Thanks to that it does not absorb water at all. We also take special care to provide the right thickness of its side walls. It is never less than 3 cm. Thanks to that it is solid and unbreakable. 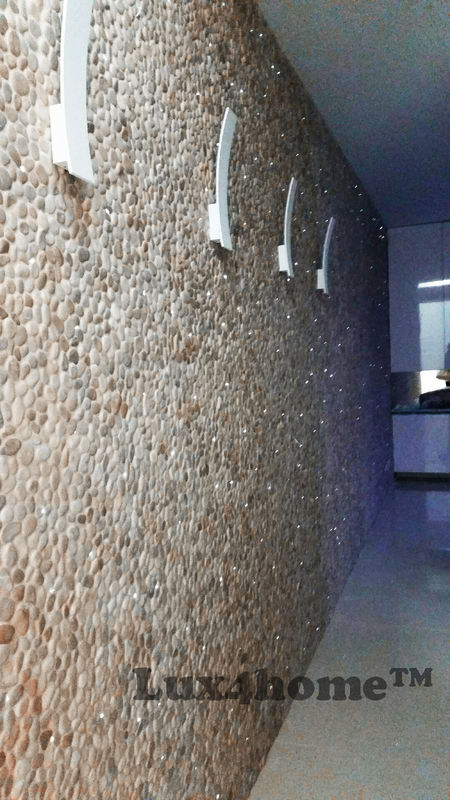 Lavabo Batu Kali looks absolutely astonishing, together with natural pebble tiles on walls. The effect is totally wonderful. Check details of natural river stone sinks! 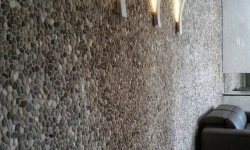 Unique interior made of white pebbles on walls. 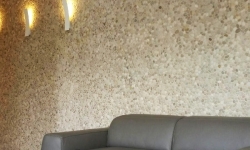 It was made of White Timor Pebble Tiles 30x30cm in ‘Tokyo Sushi’ restaurant in Warsaw – Poland. 30×30 15×30 10×30 and borders as well. 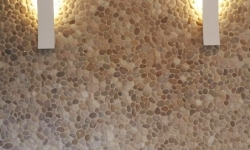 Interior designers, architects, pebble mosaics distributors, stone pebble importers or bathroom fittings, you are all welcome to cooperate with us. 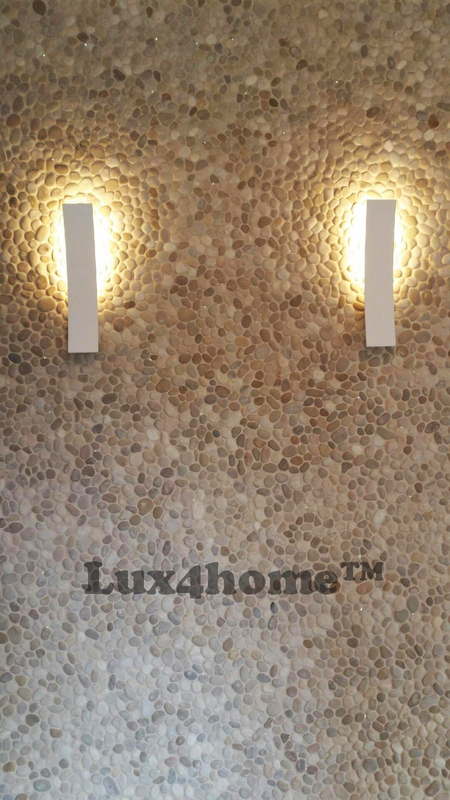 Lux4home™ is a manufacturer / producer & exporter of white pebble tiles (like this), pebble mosaics in diffrent colours, pebble borders etc.